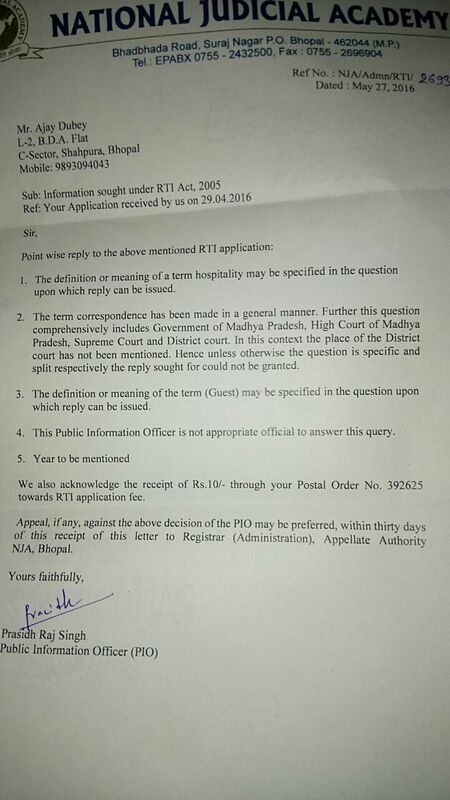 In response to an RTI application by a social activist, seeking details about expenses incurred on the Retreat of Supreme Court Judges organised in Bhopal in April in 2016, the National Judicial Academy has asked an RTI applicant to define certain terms used in the RTI application like‘ hospitality’ and ‘guest’. The RTI application was filed by Social activist Ajay Dubey. Following is the information he sought and the replies he got. He asked about expenses incurred on board and lodging of the judges attending the retreat and giving away gifts to them, besides relevant file noting. As a reply, he was asked to define ‘hospitality’ (a term used in the query) as a pre requisite of providing answer to the question. He enquired about Correspondence made with Supreme Court, Madhya Pradesh government, MP High Court and District Court, Bhopal, in connection with retreat, and the NJA replied him that “the term correspondence has been made in a general manner”.“Further this question comprehensively includes Government of Madhya Pradesh, High Court of Madhya Pradesh, Supreme Court and District Court. In this context the place of the District court has not been mentioned. hence unless otherwise the question is specified and split respectively the reply sought for could not be granted,”reads the response. Sought names of guests and copies of speeches made by them. The Academy asked the applicant to give the definition of “guest” first. In short, none of the questions asked by the RTI activist was answered by the NJA. Instead he was asked to clarify about the terms he used in the query. Talking to LiveLaw, Ajay Dubey said“I strongly condemn anti transparency attitude of NJA. NJA should remember that they are not beyond law and accountable to taxpayers’ will also request CJI to take appropriate action against NJA Management”. Live Law had reported about the retreat which started from April 14, at National Judicial Academy, Bhopal campus, which boasts of recreational facilities including a fully-equipped gymnasium, swimming pool, sauna, tennis, billiards besides a 280-seater state- of-the-art auditorium and conference and seminar rooms. 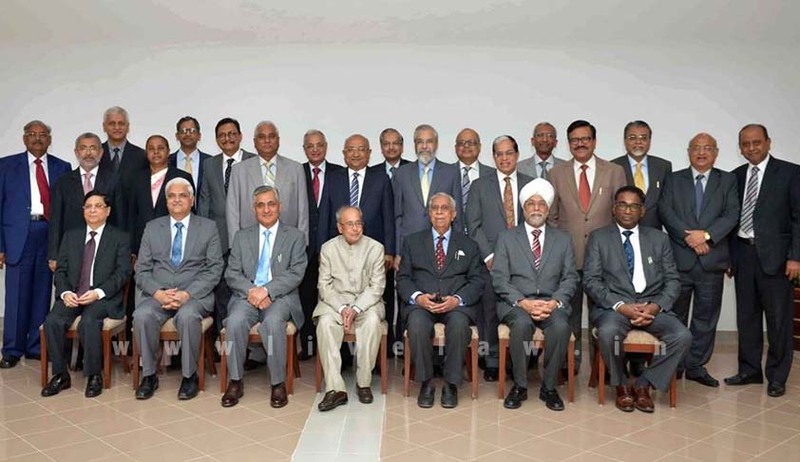 During the retreat, the Chief Justice of India and Judges of the Supreme Court of India were briefed for almost an hour, in a closed door session conducted by National Security Advisor (NSA) Ajit Doval. Campaign for Judicial Accountability and Reform had demanded that human rights organizations and lawyers be invited for the briefing of Judges. In the letter, CJAR Convenor Advocate Prashant Bhushan had emphasized on the conflict between the perspectives offered by the security agencies and those that are offered by human rights organizations, on the legitimacy of several actions undertaken by security agencies. You may read the LiveLaw story here. Read the RTI application and NJA's reply here.